Click here to buy Eco One right now! Congratulations on your purchase of the EcoOne Spa Treatment System Starter Kit. Everything you need to convert your spa into a clean, natural and earth / health–friendly environment is included in this kit. EcoOne Monthly Spa Treatment is the finest, easiest to use and safest spa water conditioner on the market today. Your Spa water will be softer, clearer, with no odors, no foam, and no irritation to the eyes or skin. Eco One is a unique formulation of Natural enzymes, minerals, and plant extracts that contains no chlorine, bromine or other harsh chemicals. EcoOne can act as a replacement for, or greatly reduce your need for the vast majority of your spa-care chemical regime. One bottle of Eco One Monthly in conjunction with a chlorine shock treatment will effectively keep your spa water crystal clear and odor free for 30 days or more. Reduces the majority of your spa care chemical regime including: chlorine*, bromine*, foam reducers, pH Up, pH Down, clarifiers etc. Never scrub your spa again. Click here to buy EcoOne right now! Now that you've made the plunge and purchased your new spa, or simply decided to give up the "chemical soup" in your old spa, you'll want to get started as quickly as possible. This page is a quick start guide. Please follow these instructions carefully and take a moment later to return and read the entire contents of this booklet. 1. Remove all Filter Cartridges and clean them with Filter Cleanser. 2. Fill your tub or use the existing water in it. 4. Run jets on High Speed for 1-2 hours. 5. Drain and thoroughly rinse spa. 7. Put your cleaned filter cartridges back into the spa. *NOTE: For first time Eco one users, heavily contaminated spas, Brand new spas, or newly purchased used spas, use ENTIRE BOTTLE of Pipe Cleanser and allow to work for up to 24 hours. This process will flush out any debris & chemical residue in the pipes. You must go through the cleaning process. We know it’s inconvenient, but it is necessary for Eco one to work properly. During the process, your water may become cloudy and you may see “things” floating in the water. Don’t worry, this is normal. 11. With Jets and Blower (if any) running add entire bottle of Eco One Monthly. Add 2 ONEshock Tablets directly to the water. Remove the filter cartridge; hose it off and replace. We recommend shocking the spa each time you use it for maximum results. Just add 1 ONEshock Tablet to the water when you get out of the spa. Run Jets for 3-5 minutes to circulate. “Eco One” Monthly is designed to last 30 days. You will need to add a new bottle every 30 days. Follow steps 8-12 above. Clean your filter cartridge with Eco One “Filter Cleanser” or another type of filter cleaner. **NEVER USE SOAP BASED PRODUCTS TO CLEAN YOUR FILTER CARTRIDGE. We recommend draining, cleaning and refilling your tub every 3-4 months. We also recommend doing a Plumbing cleansing with the pipe cleaner at every 3rd or 4th draining.(Approx. Once a year). This will ensure you have a completely clean tub. Powerful yet gentle cleansers: Eco One contains powerful cleansers that break down suntan oil, body lotions, and other unwanted contaminants, dissolving them harmlessly, eliminating the cause of unsightly scum and foam. Flocking Agents: Eco One contains pure organic compounds that are naturally attracted to contaminants and minerals in the water. Solid contaminants clump together into larger particles that get swept up and caught in the filter where they belong. This natural flocking action keeps your water crystal -clear for a full month. Natural Water Softeners: The natural water softening minerals in Eco One reduce the surface tension of the water and help prevent scale from forming. The water feels soft and equipment is protected. Enzymes: The secret to Eco One is our proprietary blend of natural enzymes. Enzymes accelerate natural bio-processes and keep your spa water sparkling clean without the "chemicals soup," odor, irritation, dry skin, testing or water balancing. Enzymes increase the interaction between elements. They are added to detergents to help break down blood, fat, perspiration, and grass stains. Lipase and Cellulase enzymes soften the fatty exterior walls of microscopic cells, causing them to rupture more easily. Amylase and Protease enzymes help break down starches and proteins. Oxidase and Hydrolase enzymes increase oxidation and promote the rapid degradation of many substances. Enzymes originally were extracted from both plants and animals, but can now be grown naturally in common soil. Our enzymes are of food grade type housed in a coconut oil base, contributing to the effectiveness of the solution. As the solution breaks down during use, the coconut oil is released and gradually coats the filter cartridge, which improves filtration and makes cleaning the filter much easier. Coconut oil has the added benefit of being an excellent skin softener! The result is much healthier water, fresh, clean and clear without fear of exposure to harsh chemicals or their negative side effects. Use Eco One Plumbing Cleanser every time you drain and refill your spa. New and old spas must be purged with Eco One Plumbing Cleanser before converting to the Eco One Monthly Spa Treatment. New Spas are "wet tested" at the factory to make sure that everything works correctly and to guarantee there are no leaks. Then they are drained and wrapped in a protective coating. Eventually they are shipped to the dealer or the new owner. Because these spas have been wet, algae and mold may grow inside the plumbing. They also have manufacturing residues that slowly wash out and can cause cloudy water for many months. All other Spas especially 2 years or older will have chemical residues, hard water deposits, corrosion and other contaminants hidden deep inside the plumbing and fittings that cause irritation, cloudy water and pH imbalance. 3. Add ½ bottle of “Eco One Plumbing Cleanser" directly to spa water. 4. Run jets on High Speed for 1 hour. 8. For first time use and/or heavily contaminated spas use entire bottle and allow to work for up to 24 hours. * NOTE: Optional: You may wish to use a chlorine "sanitizer shock" treatment (Such as EcoOne ONEshock) at this step to clear your water of any bacteriological impurities that may be in your municipal water supply. Do not use your spa during a chlorine shock. Avoid contact with your spa water when using high concentrations of chlorine. Avoid exposure to chlorine fumes. Follow manufacturer's instructions carefully. Running your blowers and jets will dissipate the chlorine over time. Use Eco One Vinyl Spa Cover Cleaner at least once a month or as needed. Eco One Vinyl Spa Cover Cleaner will keep your cover looking like new, protect it from the elements and help reduce odors in your tub from mold and mildew buildup. Spray directly on to cover surface. Wipe with a soft cloth and buff dry. Clean inside and outside of cover, paying particular attention to any mold or dark areas in the seams and cracks. Spray product directly on cloth for hard to reach areas. Apply Eco One Enzyme-Plex Filter Boost directly to your filter compartment after each monthly cleaning. Eco One Enzyme-Plex Filter Boost will improve the efficiency of your filter, make it easier to clean and help to remove damaging minerals and phosphates from your water. Each container contains a six month supply for average home spa use. Wash your filter(s) thoroughly, using a garden hose or kitchen sprayer. Be careful not to damage the filter elements. You may use any type of Cartridge filter cleaner. We recommend using Eco one cartridge filter cleaner. If your filter has black marks on it, it may be moldy. The filter should be discarded. Be sure to rinse your filter completely before adding Enzyme-Plex Filter Boost. Mix 3 caps full of Filter Boost in a glass of water. Run spa jets and pour mixture directly into filter intake. Water may be cloudy for a brief period of time. Eco One Monthly will keep up to 500 gallons of water looking and feeling great for one month with average use. If you use your spa 3 to 5 days a week for twenty minutes each day, we consider that average use. Heavier use may require more frequent additions of Eco One. Carefully follow instructions for Eco One Monthly, and Eco One Filter Boost. Every 30 days run jets and blowers while adding a new bottle of Eco One Monthly. Heavy spa use may require more Eco One. Rinse hands thoroughly after handling Eco One products. Do not take internally. If accidental ingestion should occur, drink water. If allergic to certain foods such as coconut or seaweed, contact your physician. Eco One Monthly can be very slippery when dropped. Exercise caution in spill areas. Soak up spilled product with kitty litter or household mop. There are no special disposal requirements. Products contain: natural enzymes, minerals, coconut, potassium salts and lemon fragrance. Use Eco One non-chlorine shock per instructions. Drain and refill spa. Water has "Crashed." The may be a problem during the first couple of months of Eco One use in older spas that have a great deal of built up deposits in the pipes and equipment. - drain and refill spa, bypassing water softener. Use non-chlorine shock per instructions. A basic tenet of chemistry is that when mixing an acid with a base, the resulting compound will be a salt. Chlorine is a very powerful and caustic 'base' and pH down is a very powerful acid. A spa that was using an excessive amount of chemicals. It may take several months for the resulting salts to wash out of your spa. Run blowers and jets allowing foam to build up. Use a piece of cardboard to scoop foam away. Repeat until foam dissipates. Eco One will eventually break down foam. The best cure for this problem is to always take a soap-less shower before getting into your spa. During your first couple of months using Eco One, you may experience cloudy water and mild "organic odors." Use of your non-chlorine shock should clear the problem right up. This is particularly common in older spas as contaminants and gunk may continue to be loosened from your equipment and pipes. It may be necessary to repeat the Eco One Plumbing Cleanser process. A Note About Smaller Spas (under 200 gallons): Smaller spas are more difficult to maintain than larger spas, particularly under heavy use. There is a significantly higher "bather to water" ratio in smaller spas. Consequently, the same amount of Eco One Monthly should be used for small spas as large. Small spas should be drained more often as well. Never use a "clarifier" with Eco One. The clarifier can remove the residual Eco One from your water and will clog up your filter. Eco One is a natural clarifier. Cure cloudy water with a non-chlorine shock. Don't fight a chemical war with your spa, particularly with regard to pH. Eco One will gently help to maintain ideal pH and alkalinity in your spa. However, when you add a sanitizer or non-chlorine shock treatment, the pH will shift somewhat. Add the chemical, run your jets and then let the spa sit for awhile, then check your pH. Nine times out of ten, the water will return to a normal pH range. On the rare occasion when you find that you have to adjust your spa's pH, if you don't have any pH up or down available, some common household items can be used. White vinegar or concentrated lemon juice (no pulp) will lower your spa's pH while common baking soda will raise it. Check your spa's instruction manual to make sure that it does not specifically forbid these methods before implementing. Clean your cover at least monthly with Eco One Cover Cleaner and conditioner. This will help to reduce odors in your tub as well as minimize sanitizer load. You will also extend the life of your cover. Foam: The best method to avoid ever developing a foam problem is to always take a quick, soap-less shower before entering your spa. Chemical Sanitizer Levels: Try to use the very minimum recommend amount of sanitizer residual in your spa, particularly when using ozone (.5 ppm). Always test your water BEFORE adding a sanitizer. Be careful to monitor your chemical level closely as you may find that the use of Eco One significantly increases chemical sanitizer longevity. If you don't use your spa for a long period of time, you may find that the water stays nice and clear for up to 3 months. 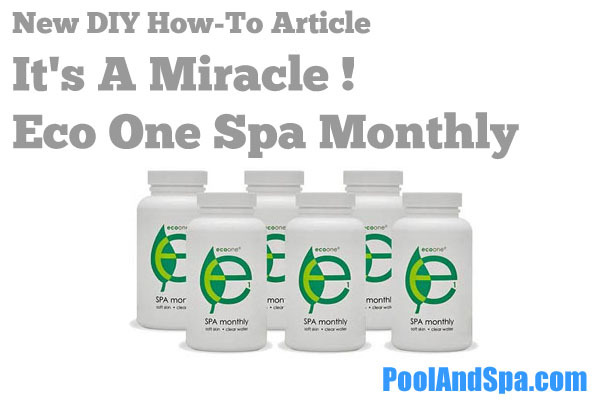 Before using your spa again you need to add a new bottle of Eco One Monthly to recondition the water and add 2 Tablets of Ecoone ONEshock. Never heat your tub to more than 104 degrees. Excessive heat can be damaging to your heath as well as your spa equipment and can Kill the Ecoone Enzyme. Avoid making "Chemical Soup." In the end, it's cheaper and healthier to drain and refill a spa that has "gone over" than to chase it with chemicals, trying to "burn out" the problem. Respect the environment and respect your health. Use the least number of toxic chemicals as is safely possible. Eco One can replace the vast majority of your toxic chemical mix with gentle, eco-friendly enzymes and natural compounds. Your choice of a sanitizing agent is your choice. Remember that ozone is an extremely powerful yet safe sanitizing agent, However, some sort of Bromine or chlorine should be use as well. Consult with a physician before using your spa If you have high blood pressure or other heart problems or are pregnant. Chlorine and Bromine are dangerous chemical compounds when handled improperly. If you use chlorine or bromine as a sanitizer always use the minimum recommended residual amount. Never allow children in the spa immediately after adding chlorine or bromine. NEVER expose yourself to chlorine or bromine dust. Do not scatter chlorine or bromine in the tub as the finer particles can be swept up in the wind and into your lungs. Be sure to follow manufacture's instructions carefully. 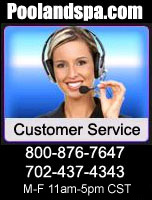 PoolAndSpa.com's Customer Service Hotline is 1-800-876-7647 or 1-702-437-4343.